If you have followed me for some time, you now probably know I scheduled some of my posts. Since I work full time and my time is compromised, when I make multiple projects, I try to schedule them so I keep this blog alive and have content all the time. So I'm scheduling this for tomorrow (Saturday), and when you get to see this post I hopefully will be attending my DH's sommelier graduation. Oh God! 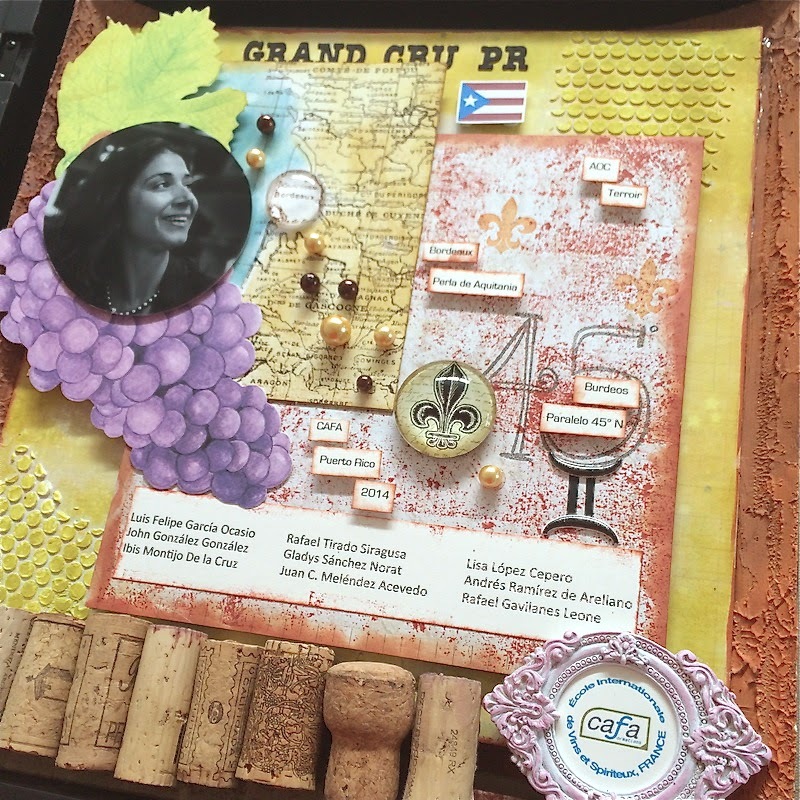 So I had this idea to give the teacher something on behalf of the 9 new sommeliers in the world. I prepared this composition of elements for her. First of all, let me tell you about this woman. 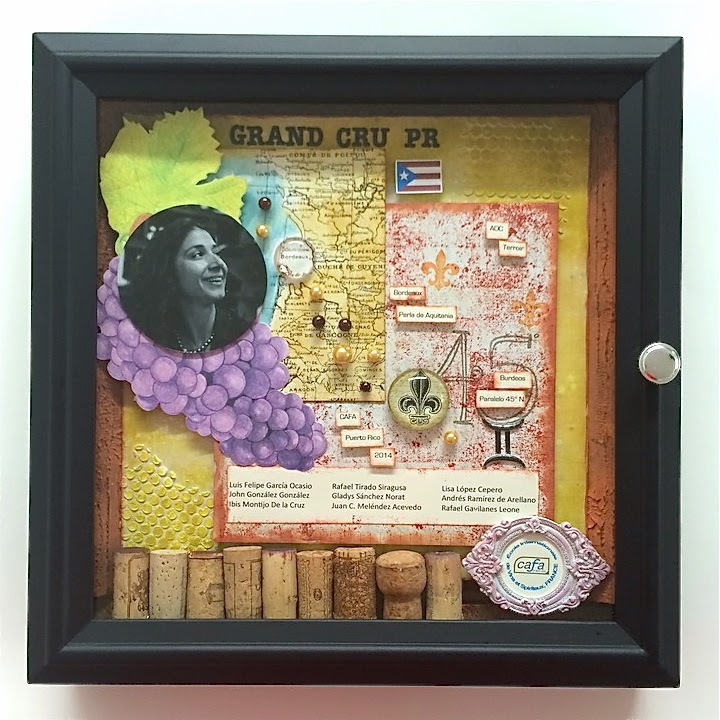 She's a Puerto Rican who decided to move to France more than a decade ago, to learn about wines. She thought this was going to be a short stay but wines' world is fascinating and you never stop learning. So she literally moved to Bordeaux and she's been living there for a while. She's a wine expert who provided classes in the prestigious school of sommeliers in France, called CAFA. She is great! But long story short... she achieved to bring this school to Puerto Rico, so we can study and graduate locally. She has achieved a lot, and she really is a pride for our island. So talking about the composition I made. I tried to include as much elements I could to tell a story and so when she looks at this, she can remember this team who admires her so much. So I went mixed media full and made this specially for her. Loved the process making it because as you know, I love to make these kind of projects that are personalized and have a real meaning to the person who will receive them. I inspired a lot on another project I made for my husband and that was also inspired in a class with Frank García. You can see that project clicking HERE. There are symbols of Bordeaux, such as the map, the 45 N parallel, the fleur de lis, and the pearls. I included Puerto Rican flag and even her horoscope symbol since she constantly asks for others' horoscope and knows a lot about that topic. The names of all the students who passed the course were included as recipients of her knowledge... and there's a cork for every one of them. I hope she likes it... and above all, I hope she really embraces it as a symbol of the admiration we all have for her. Tks for stopping by and tks for your comments.